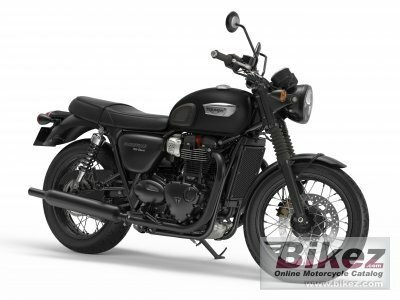 2018 Triumph Bonneville T100 Black. Picture credits - Triumph. Submit more pictures. The Bonneville T100 Black is loaded with urban style and attitude. Brimming with sophistication and individuality, the T100 Black takes styling to a different level with fully blacked-out high-quality details, including wheel rims, engine finish and beautiful twin skin �peashooter� exhaust in a matt black finish for a truly distinguished look. Price as new (MSRP): US$ 10650. Prices depend on country, taxes, accessories, etc. Front brakes: Single disc. Nissin 2-piston floating caliper. ABS. Rear brakes: Single disc. Nissin 2-piston floating caliper. ABS. Wheels: 32-spoke. Steel rims. Black. Ask questions Join the 18 Triumph Bonneville T100 Black discussion group or the general Triumph discussion group. Bikez has discussion forums for every bike. View comments, questions and answers at the 2018 Triumph Bonneville T100 Black discussion group. You can sign up for e-mail notifications when other riders answer you. If you have extensive experience with the MC, please send us a review. If you consider buying this bike, you should view the list of related motorbikes Look at photos. Compare technical specs. And check out the rating of the bike's engine performance, reliability, repair costs, etc. You can compare the rating with other bikes.